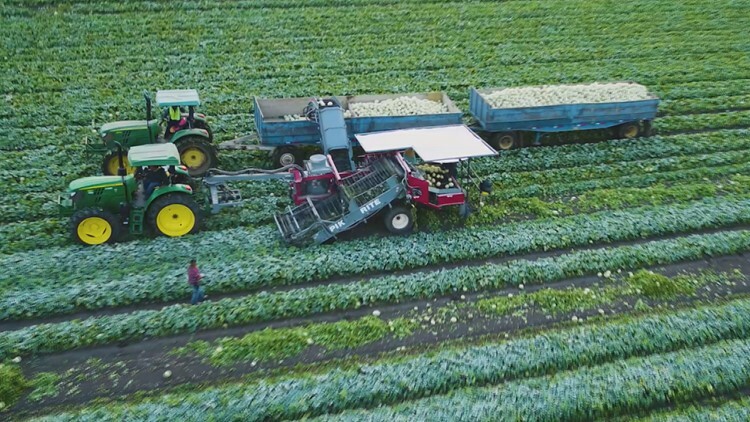 It takes modern machines to harvest California food and a modern farmer to bring it to your table. It's harvest season in Northern California and it takes a lot of modern-day machinery to get food to your table. That modern-day machinery picks, pulls, and sorts just about any kind of produce you can think of. The three-month tomato harvest in Yolo County starts in July. From the sky looking down, the perfectly straight rows of tomato plants seem to resemble ripples in a lake. It's a bounty that would take even the most experienced person a lifetime to pick by hand. That’s why the Muller family in Woodland uses half-million dollar harvesting machines to pick their fruit. Honeydew melons are harvested by the truckload in Knights Landing. About 10 miles north of Woodland, honeydew melons are piling up by the truckload in Knights Landing. Both man and machine work together to remove the green leaves from the melons. Only the best looking ones make it to the conveyor belt. If you were to fly overhead, you would see skilled workers throwing damaged or less desirable melons back into the field to be plowed back into the soil. In Colusa County, sunflowers have lost their golden color. A combine just outside the city of Colusa mows through dried stems and consumes the entire plant. Ben Carter starts harvest in late August and early September. "These are hybrid sunflowers for seed, and we use a combine to harvest them. We only harvest the females. The males are destroyed," Carter said. In one massive swath, the plant is fed into the belly of the machine, smashing and separating the seeds from the petals, and spitting out the leftovers. "It would be way too time-consuming to do what we do without the mechanization," Carter said. In Maxwell, the smell of cucumber lingers in the air as the harvester turns a leafy green field into a sloppy brown mess. The cucumbers in this field are not destined for the supermarket. The tumbling basket rollers smash the cucumbers to small pieces. The seeds are released and sent into a holding container. After a thorough drying, they will be packaged and sold to a garden store near you. "California is one of the most productive states in terms of agriculture," Carter said. "We farmers take pride in feeding the world."